To argue against raising the minimum wage, which has not kept up with inflation, is to stand with billionaires. And there really is nothing to argue about here because we have the historic proof. 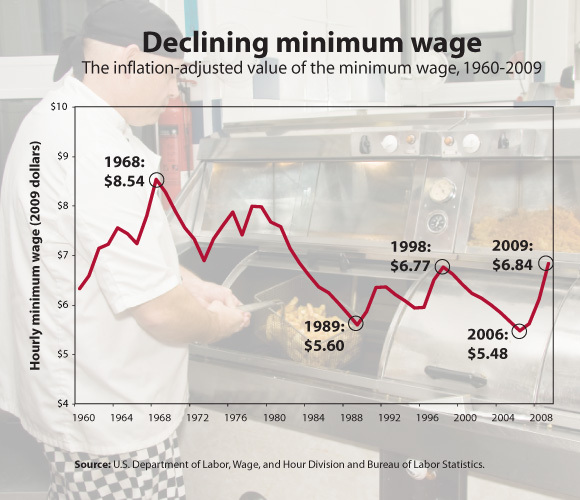 In the 1960s the purchasing power of minimum wage was much greater than it has been over the past decade. Which of those decades had a more robust economy? I’m not arguing that there’s a direct correlation. But as you can see, conservatives cannot argue a direct opposite correlation either, keeping in mind recessions and periods of economic expansion. The point is, we should pay people a living wage, a wage that doesn’t require propping up by government subsidies, and stop trying to guess the effects of doing the right thing. Being against a minimum wage increase is not an argument in favor of preserving jobs, as many conservatives argue, it’s an argument in favor of preserving profits. McDonald’s and Walmart can afford to pay their workers non-poverty wages while maintaining a healthy profit and keeping prices low. A higher minimum wage would not be devastating to business because (a) it would apply to all businesses (you and your competitor), and (b) it increases the purchasing power of tens of millions of Americans which means more revenue for these companies. The economic model we’ve followed for several decades now during the era of trickle-down theory is a road to oligarchy rule. Corporations continue to squeeze their employees as executives continue to reap over 90% of the economic gains. This is not a recipe for a healthy middle class. I’ve got news for you, the idea of a middle class is new in human history and it is not solely a result of modern capitalism. It also took the right government regulations and tax policies to make it happen. But from the Reagan administration until today we’ve listened to the wrong people, the people who look to further consolidate their wealth at the expense of everyone else. So I say again, if you are against a minimum wage increase, you stand with the wealthy elites.